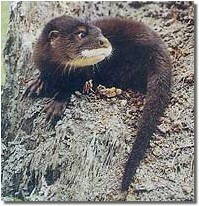 The rare hairy-nosed otter lives in the countries of Java, Borneo, Sumatra, Malaysia, Cambodia, Thailand and Indonesia. They are extremely rare, and were thought to be extinct until a population was reported in Thailand in 1998. They may be extinct throughout much of their range. They live in areas of peat swamp forest, reed meadows, canals, shallow coastal waters, and mangrove forests. 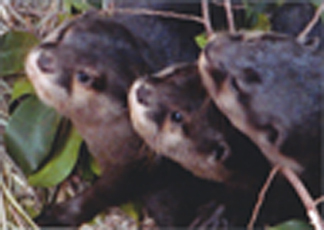 The hairy-nosed otter is similar in appearance to other freshwater otter species. They get their namesake because their rhinarium is covered in hair, unlike most other otter species. They vary in coloration from a reddish chestnut to dark chocolate brown, with white on their throat, lower jaw and part of the upper lip. Since this otter is so rare, it is unknown what they feed on. It is assumed their diet is similar to other otter species. Nothing is known about this otter's reproductive habits. Nothing is known about this otter's behavior either. Major threats to this otter species are from humans. Fishing, crop cultivation, pollution, hunting for their pelts, and habitat destruction have all adversely affected this species.